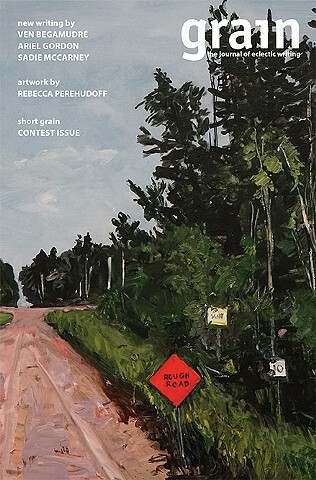 I was honored to be the featured artist in the current issue of Grain Magazine, a publication of the Saskatchewan Writers' Guild. The issue is entitled 'Heavy Traffic' and includes an essay I wrote about the work. It was great to see my work up in the East Village Artifact Gallery! It was great to have seen everyone who attended the opening. It is always great to see really good art in New York City. Delacroix was on at the MET, Morris Lewis at Yares Gallery on 5th Avenue and Darby Bannard at Berry Campbell Gallery in Chelsea. The entire city of Venice is dedicated to Tintoretto this year. There is a block buster exhibit at the Doges Palace, an exhibit of Tintoretto's early work at the Academia and of course, Tinorettos in seemingly countless churches and Suolas. I have a much better appreciation of his phenomenal accomplishment. I came away still loving Titian best but also loving Tintoretto's large scale compositions. (I always loved his portraits which capture personality and mood with exceptional sensitivity). The photo is St Mark flying in to free the slave. It's at the Academia and was said to be a pivotal transition piece leading to his mature work. "I'm showing some painting in NY this December!" 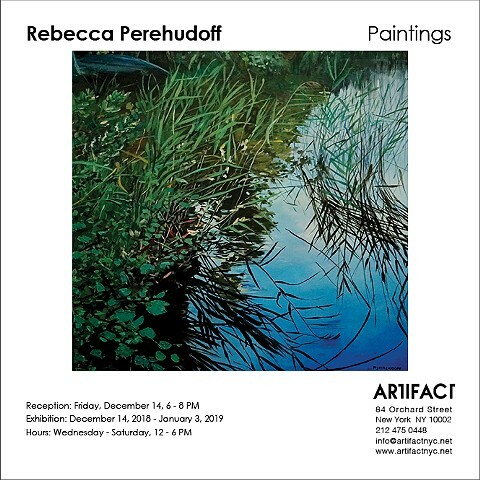 I am showing some paintings at Artifact Gallery in NY East Village December 14. The show (I'm one of 3 artists) is up from Dec 14 to Jan 3. 84 Orchard Street NY NY 10002. I'm really hoping to see some friendly faces! The opening is December 14 from 6-8 pm. 1. The Gallery/Art Placement in Saskatoon, SK will be celebrating its 40th anniversary August 4th. I will have one or more artworks in the anniversary group show. 2. Artwork for an exhibition in New York was chosen. 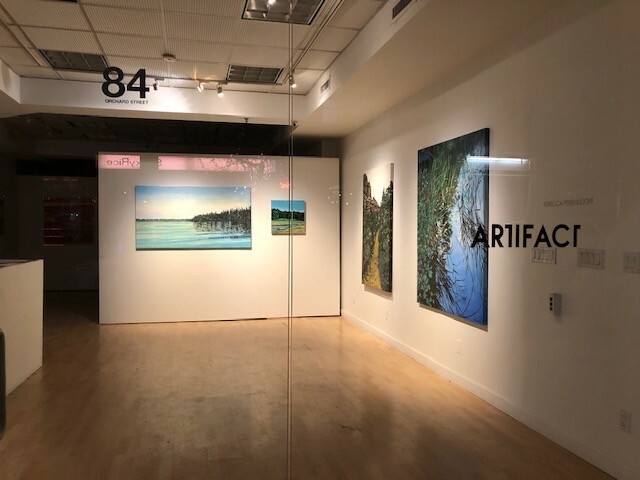 The exhibition will be at ARTIFACT on December 14-Jan3, 2018. The opening reception will take place on Wednesday December 14, 2018. 3. Foreign Affairs Canada has purchased one of my paintings. Who knows where it will end up. I have been told I have a painting in a diplomatic residence in Beirut and one at a UN office in New York. 4. I had a great week in France in June. 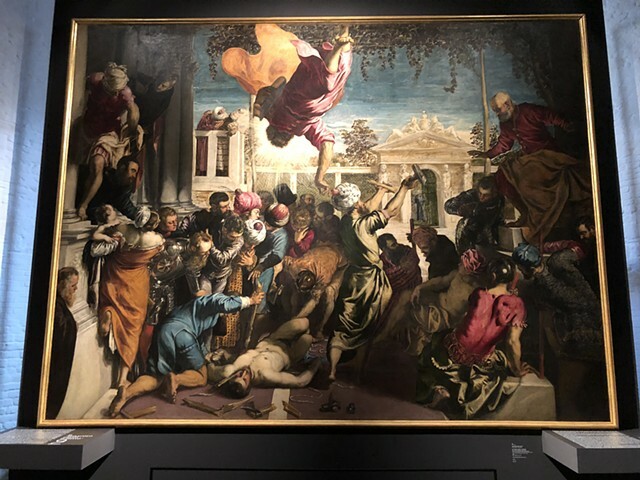 I thought the Tintoretto exhibition at the Musée de Luxembourg and the Monet and Abstract Expressionism exhibition at the Orangerie were worth seeing. As of April 15th, taxes are in, the weather is too miserable for outdoor painting but I am eyeing the daffodils and blue Scilla struggling to bloom in 30-40 degree weather. I'm really looking forward to the William Perehudoff and Dorothy Knowles exhibition at Winchester Gallery in Oak Bay, Victoria, BC May 5th, both to see the beautiful colors of the artwork and to revel in the warmer temperatures. 2 of my artworks were exhibited at Art Shopping in Deauville, France. The French connection will continue with a week in June in Paris...a chance to revisit museums. I am delighted and grateful to hear that Global Affairs recently acquired two paintings completed last summer in Saskatchewan. Rumor has it I have artwork at diplomatic locations in Beirut and at the UN in NY. Major move for me: I've rented a studio near downtown LaGrange, IL. so I am enjoying the bright sunlight that comes with a 1930s storefront. Back in the day, apparently, it was Bud's Steakhouse! 2017 was a busy year. I exhibited two paintings at the Louvre 'Art Shopping' and a gallery group show in the Marais district of Paris. I was able to make my annual painting trip to Saskatchewan and exhibited some of the work from that trip at the Gallery/Art Placement Year end group show in Saskatoon. Above: " The Point with Red Sun 16" Acrylic on Canvas 28.5" x 54"
I was painting at Emma Lake in July which was wonderful, of course...perfect weather. A work of mine is in 'Art Shopping' Mecenavie, Booth, Carousel du Louvre, Paris, France! and my daughter Molly, who is studying at HEC outside of Paris, will be there to check it out...even if I won't be. I was in Paris, however, in August to drop off work for a group show at Mecenavie/Gallerie Thuillier, at 13 Rue de Thorny, 75003 Paris, France (September 16-29).er. My work was also exhibited in Art Expo, New York in April of this year with World Wide Art-Artavita. I made my annual painting pilgrimage to Saskatoon and Emma Lake where I focused primarily on painting acrylic works on paper. I was expecting smokey skies after all the drought and terrible fires but the rain came and cleared things up. Emma Lake is a sad place with the Kenderdine Campus closed and no artists about. I exhibited 3 paintings in the Artavita art fair in Los Angeles in October, 2014 and a painting at the Southern Nevada Museum of Art in Los Vegas this summer. Wow. It's the end of summer...the end of another summer! It has gone by so quickly. Everyone says that but it's true. Time is speeding by these days. So here is what I did. Scott and I made a first visit to New Mexico and southern Colorado. We looked at the galleries in Santa Fe and the hot springs in Pagosa Springs and Durango. The iconic pueblo ruins at Mesa Verde were, of course, stunning as was the burnt forest on the mesa above the ruins. I wished I could just stay there for a few weeks and paint it. Later in the summer I made my yearly pilgrimage to Saskatchewan to paint at Emma Lake with my mother and as always it felt so good to be there. My visit coincided with the Emma Lake workshop so I took advantage of that. I hadn't originally intended to participate but I was glad I did. It was inspirational to meet up with and work along side artists Catherine MacAvity, Pat Service and others but also to become acquainted with the guest, Elizabeth Mcintosh and her impressive work. 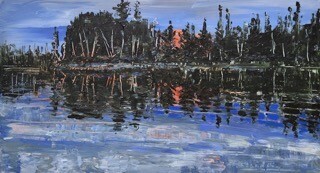 When I paint at Emma Lake I tend to work so intensely that I am kind of blitzed afterwards but it is a good kind of blitz. My only regret was that I didn't do more canoeing. Well, another regret, is that suddenly Emma Lake is sporting property developments everywhere. The gallery/art placement in Saskatoon included me in a couple of group shows this summer which was nice. They also had a group show of their staff work which was really worth seeing. Along with powerful pieces by Robert Christie and Jonathon Forest, there were seriously good works by the rest of the staff. I got some vicarious travel thrills from my daughter Molly who did a practicum with Triangle Arts Organization in New York this summer and through my sisters: Carol Perehudoff in Italy and Cathy Fowler in Nova Scotia. A really special event for me was a trip to Oshawa, Ontario to see the Optimism of Color, a retrospective of the work of my father, William Perehudoff. This was curated by Karen Wilkin of New York who gave a very illuminating opening talk. The exhibit runs from June 23 to September 9 so there are a few more days to see it.